David was the recipient of the Bingham Award in 1989. An NCAA Champion in 1987 and 1989 in the 100-yard backstroke, David became Harvard’s first individual to win NCAA swimming gold in 27 years when he won in 1987. 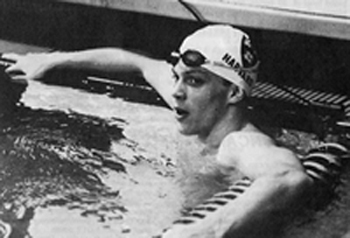 At the 1989 Eastern Seaboard Championships; David won the 200-yard individual medley, the 100-yard backstroke, twice breaking his own American record, and the 200-yard backstroke, narrowly missing another American record. His performance earned him the Phil Moriarty Award as the top point-scorer. That same year he earned Eastern Seaboards Most Valuable Swimmer, Eastern Seaboards Most Valuable Senior and First Team All-Ivy honors. He earned All-American honors as a sophomore, junior and senior and received Honorable Mention All-American as a freshman. A First Team All-Ivy selection in all four years with the Crimson, he also grabbed the silver medal in the 200-meter backstroke at the 1989 NCAA Championships. Outside of Harvard, David was a U.S. Olympian in the 1988 Seoul Olympics. His record-setting U.S. medley relay team brought home the gold that year. Individually he set a world and U.S. record in the 100-meter backstroke. Sitting around one evening a few months ago, I came up with a few statistics that might help put my swimming career into perspective. From 1972 to 1992 I spent the equivalent of three full years or 26,000 hours submerged in the water. In 1992, three years represented 12% of my life. Translated further, these statistics equate to 92,000,000 yards (or 17,500 miles) of swimming, plus 2,900 races, and travel to 24 different states and 14 countries. The payoff was four world records, three world bests, nine American records, 2 individual NCAA titles, and 2 gold, one silver, and one bronze Olympic medals in two Olympic Games. There is no doubt in my mind that Harvard played the greatest role in shaping who I am and what I have achieved in life. I came to Harvard as a know-it-all kid with little discipline, a lot of attitude, and big dreams. I was the Harvard Class of '88 "mistake." Despite obvious shortcomings, my coaches interpreted my quirks and refocused my attention. I learned how to work hard and manage my time. My swimming improved as did my academics. My teammates provided an atmosphere filed with the ethics of hard work, encouragement, and cooperation. My professors and the administrative staff supported my successes. I left Harvard as a very different person. In the end I likely overachieved. It is difficult to tell you all of what I feel as a result of all of this distance, time, and good fortune. No one moment during my four years at Harvard stands out as the best. My life at Harvard and my new life in Montana seem so unreal. I am truly very lucky. I am honored to have been asked to become a member of the Harvard Varsity Club Hall of Fame and share this moment with my east coast family, my Montana family, my friends, and the other incredible inductees. Thank you so much.